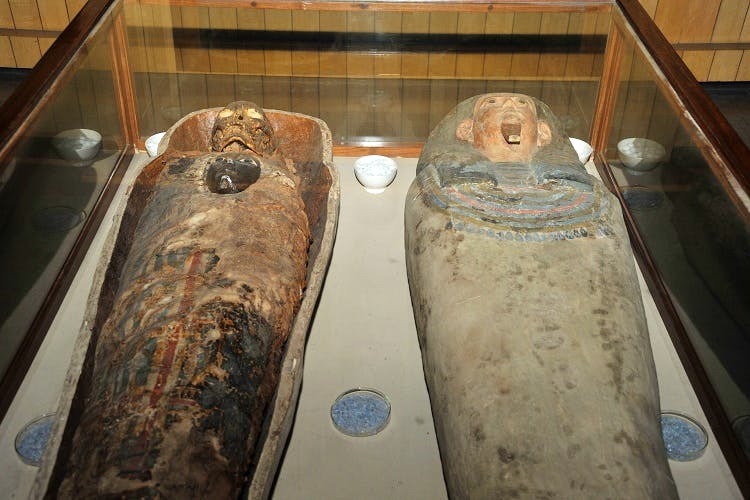 This weekend, check out an ancient mummy from Egypt at the Indian Museum. It’s a 4,000-year-old mummy, one of six in India. Somewhere in the Journal of the Asiatic Society of Bengal, an entry says that it was one EC Archbold, a British officer and Lieutenant of the Light Cavalry of Bengal, who had gifted the mummy to the society in 1834. The Journal mentions that the mummy was obtained with some difficulty from the royal tombs at Gourvah on the western bank of the Nile at Luxor, Egypt. The difficult part? The ship’s crew had objected to having a ‘corpse’ on board. The mummy gets pride of place in the hall for Egyptian artefacts in the Indian Museum. Unfortunately, the flesh on the face and head has crumbled, exposing the skull. For some reason, the mummy’s mask has been removed and placed on the chest. Yep. We are saving the best for the last. In true-blue, CSI-style forensic sleuthing, CAT scans have revealed that the person behind that bandaged exterior was a girl. That her lower back – and an ankle – had probably been injured. And part of her brain had been removed. Do not take photos with your mobile – as most clueless visitors to the museum do. The mummy is supposed to be kept under controlled temperature and light settings. So all those flashing phones are not good for it. And do have some respect. Selfies are not meant for every place. Did You Know You Could Take A Tour Of The Indian Museum From The Comfort Of Your Home?